Homo floresiensis ("Flores Man"; nicknamed "hobbit") is an extinct species in the genus Homo. The remains of an individual who would have stood about 1.1 m (3 ft 7 in) in height were discovered in 2004 at Liang Bua on the island of Flores in Indonesia. Partial skeletons of nine individuals have been recovered, including one complete skull, referred to as "LB1". These remains have been the subject of intense research to determine whether they represent a species distinct from modern humans, though the dominant consensus is that these remains do represent a distinct species due to genetic and anatomical differences. This hominin had originally been considered remarkable for its survival until relatively recent times, only 12,000 years ago. However, more extensive stratigraphic and chronological work has pushed the dating of the most recent evidence of its existence back to 50,000 years ago. The Homo floresiensis skeletal material is now dated from 60,000 to 100,000 years ago; stone tools recovered alongside the skeletal remains were from archaeological horizons ranging from 50,000 to 190,000 years ago. Fossil teeth and a partial jaw from hominins assumed to be ancestral to H. floresiensis were discovered in 2014 and described in 2016. These remains are from a site on Flores called Mata Menge, about 74 km from Liang Bua. They date to about 700,000 years ago and are even smaller than the later fossils. The discoverers, Mike Morwood et al. (2004), proposed that a variety of features, both primitive and derived, identify these individuals as belonging to a new species, H. floresiensis, within the taxonomic tribe of Hominini, which includes all species that are more closely related to humans than to chimpanzees. Based on previous date estimates, the discoverers also proposed that H. floresiensis lived contemporaneously with modern humans on Flores. Two orthopedic studies published in 2007 reported evidence to support species status for H. floresiensis. A study of three tokens of carpal (wrist) bones concluded there were differences from the carpal bones of modern humans and similarities to those of a chimpanzee or an early hominin such as Australopithecus. A study of the bones and joints of the arm, shoulder, and lower limbs also concluded that H. floresiensis was more similar to early humans and other apes than modern humans. 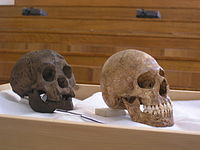 In 2009, the publication of a cladistic analysis and a study of comparative body measurements provided further support for the hypothesis that H. floresiensis and Homo sapiens are separate species. In 2015, the results of Bayesian analysis were published, which used more than 300 morphological characteristics of fossil hominins; the analysis was unable to distinguish between the different early hominin trees, but the greatest similarity of H. floresiensis was with Australopithecus sediba, Homo habilis and Dmanisi Man, raising the possibility that the ancestors of Homo floresiensis left Africa before the appearance of Homo erectus, possibly even becoming the first hominins to do so and evolved further in Asia. Van den Bergh et al. (2016) suggested derivation from a population of H. erectus that arrived on Flores about a million years ago (as indicated by the oldest artifacts excavated on the island) and rapidly became dwarfed. A phylogenetic analysis published in 2017 suggests that H. floresiensis was descended from the same (presumably Australopithecine) ancestor as Homo habilis, making it a "sister species" to either H. habilis or to a minimally habilis-erectus-ergaster-sapiens clade, and its line much more ancient than Homo erectus itself. On the basis of this classification H. floresiensis is hypothesized to represent a hitherto unknown and very early migration out of Africa. A similar conclusion was suggested in a 2018 study dating stone artefacts found at Shangchen, central China, to 2.1 million years ago. The specimens were discovered on the Indonesian island of Flores in 2003 by a joint Australian-Indonesian team of archaeologists looking for evidence of the original human migration of Homo sapiens from Asia to Australia. They were not expecting to find a new species, and were surprised at the recovery of a nearly complete skeleton of a hominin they dubbed LB1 because it was unearthed inside the Liang Bua Cave. Subsequent excavations recovered seven additional skeletons, initially dated from 38,000 to 13,000 years ago. An arm bone provisionally assigned to H. floresiensis is about 74,000 years old. The specimens are not fossilized and have been described as having "...the consistency of wet blotting paper." Once exposed, the bones had to be left to dry before they could be dug up. Stone implements of a size considered appropriate to the 3-foot-tall human are also widely present in the cave. The implements are at horizons initially dated at from 95,000 to 13,000 years ago and are associated with (found in the same stratigraphic layer as) an elephant of the extinct genus Stegodon (which was widespread throughout Asia during the Quaternary), presumably the prey of LB1. Homo sapiens reached the region by around 50,000 years ago, by which time Homo floresiensis is thought to have reached extinction. Comparisons of the stone artefacts with those made by modern humans in East Timor indicate many technological similarities. Homo floresiensis was unveiled on 28 October 2004, and was swiftly nicknamed the hobbit, after the fictional race popularized in J. R. R. Tolkien's book The Hobbit, and a proposed scientific name for the species was Homo hobbitus. It was initially placed in its own genus, Sundanthropus floresianus ("Sunda human from Flores"), but reviewers of the article felt that the cranium, despite its size, belonged in the genus Homo. The most important and obvious identifying features of H. floresiensis are its small body and small cranial capacity. Brown and Morwood also identified a number of additional, less obvious features that might distinguish LB1 from modern H. sapiens, including the form of the teeth, the absence of a chin, and the lesser angle in the head of the humerus (upper arm bone). Each of these putative distinguishing features has been heavily scrutinized by the scientific community, with different research groups reaching differing conclusions as to whether these features support the original designation of a new species, or whether they identify LB1 as a severely pathological H. sapiens. A 2015 study of the dental morphology of 40 teeth of H. floresiensis compared to 450 teeth of living and extinct human species, states that they had "primitive canine-premolar and advanced molar morphologies," which is unique among hominins. The dental study suggests a Homo erectus origin for Homo floresiensis. The discovery of additional partial skeletons has verified the existence of some features found in LB1, such as the lack of a chin, but Jacob and other research teams argue that these features do not distinguish LB1 from local H. sapiens morphology. Lyras et al. have asserted, based on 3D-morphometrics, that the skull of LB1 differs significantly from all H. sapiens skulls, including those of small-bodied individuals and microcephalics, and is similar to the skull of Homo erectus alone. Ian Tattersall argues that the species is wrongly classified as Homo floresiensis as it is far too archaic to assign to the genus Homo. The first set of remains to have been found, LB1, was chosen as the type specimen for the proposed species. LB1 is a fairly complete skeleton, including a nearly complete cranium (skull), determined to be from a 30-year-old female. LB1 has been nicknamed the Little Lady of Flores or Flo. LB1's height has been estimated at about 1.06 m (3 ft 6 in). The height of a second skeleton, LB8, has been estimated at 1.09 m (3 ft 7 in) based on measurements of its tibia. These estimates are outside the range of normal modern human height and considerably shorter than the average adult height of even the smallest modern humans, such as the Mbenga and Mbuti (< 1.5 m (4 ft 11 in)), Twa, Semang (1.37 m (4 ft 6 in) for adult women) of the Malay Peninsula, or the Andamanese (1.37 m (4 ft 6 in) for adult women). By body mass, differences between modern pygmies and Homo floresiensis are even greater. LB1's body mass has been estimated at 25 kg (55 lb). 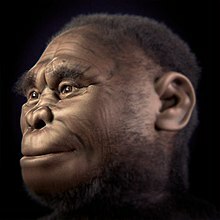 This is smaller than that of not only modern H. sapiens, but also H. erectus, which Brown and colleagues have suggested is the immediate ancestor of H. floresiensis. LB1 and LB8 are also somewhat smaller than the australopithecines from three million years ago, not previously thought to have expanded beyond Africa. Thus, LB1 and LB8 may be the shortest and smallest members of the extended human family discovered thus far. Aside from smaller body size, the specimens seem otherwise to resemble H. erectus, a species known to have been living in Southeast Asia at times coincident with earlier finds purported to be of H. floresiensis. These observed similarities form the basis for the suggested phylogenetic relationship. Controversially, the same team has reported finding material evidence (stone tools) on Flores of a H. erectus occupation dating back 840,000 years ago, but not remains of H. erectus itself or transitional forms. To explain the small stature of H. floresiensis, Brown et al. have suggested that in the limited food environment on Flores, H. erectus evolved a smaller body size via insular dwarfism. This form of speciation has been observed in other species on Flores also, as a result of selective pressures acting on island populations – including several species of the proboscidean genus Stegodon, an elephant-like creature. (A dwarf stegodont species of Flores, Stegodon sondaari, became extinct by about 850,000 years ago and was replaced by another species of normal size, Stegodon florensis, which then also evolved into a dwarf form, Stegodon florensis insularis, which disappeared about 12,000 years ago.) This theory posits that the tropical rainforests on the island are a calorically impoverished environment, causing a dietary strain on hominins, especially in the absence of agriculture. Because of reduced resources, smaller individuals have an advantage because of their lower energy requirements. This selection can also greatly affect sensory organs such as the brain, which could explain the small endocranial volume present in H. floresiensis. The insular dwarfism hypothesis has been criticized by Teuku Jacob and colleagues who argue that LB1 is similar to the pygmy peoples who populate a Flores village, Rampasasa, – and who point out that size can vary substantially in pygmy populations. Contradictory evidence has emerged. A 2018 study concluded that the Rampasasa pygmies are unrelated to H. floresiensis and represent an independent evolution of small stature via insular dwarfism. Top view of a cast of the LB1 skull. In addition to a small body size, H. floresiensis had a remarkably small brain size. The brain of the holotype LB1 is estimated to have had a volume of 380 cm3 (23 cu in), placing it at the range of chimpanzees or the extinct australopithecines. LB1's brain size is half that of its presumed immediate ancestor, H. erectus (980 cm3 (60 cu in)). The brain-to-body mass ratio of LB1 lies between that of H. erectus and the great apes. Insular dwarfism has been posited to explain the brain size reduction. Scientists at the Natural History Museum in London have found that the reduction in brain size of extinct pygmy hippopotamuses in Madagascar compared with their living relatives is greater than the reduction in body size, and similar to the reduction in brain size of H. floresiensis compared with H. erectus. An indicator of intelligence is the size of Brodmann's area 10, the dorsomedial prefrontal cortex, an area of the brain associated with higher cognition. LB1's region 10 is about the same size as that of modern humans, despite the much smaller overall size of the brain. Notwithstanding the small brain of H. floresiensis, the discoverers have associated it with advanced behaviors. Their cave shows evidence of the use of fire for cooking, and Stegodon bones associated with the hominins have cut marks, but some other sources doubt that H. floresiensis controlled fire and note that a small brain requires less energy. The hominin specimens have also been associated with stone tools of the sophisticated Upper Paleolithic tradition typically associated with modern humans, who have nearly quadruple the brain volume (1,310–1,475 cm3 (79.9–90.0 cu in)) and 2.6 times greater body mass. Some of these tools were apparently used in the necessarily cooperative hunting of Stegodon by these hominids. Cast of the entire LB1 specimen. The bone structure of H. floresiensis shoulders, arms and wrists has been described as very different from that of modern humans, and much more similar to the bone structure of chimpanzees or an early hominin. This adds support to the idea that H. floresiensis is a separate species of early human—rather than a modern human with a physical disorder. Susan G. Larson et al. analyzed the upper limb of LB1. They found that in LB1 the angle of humeral torsion is much less than in modern humans. This had been previously studied by Richards et al., who declared that it is a sign of modern pygmy populations, and T. Jacob et al., who pointed out that muscle attachments on the bone suggest LB1 had weak muscles that resulted in little development of humeral torsion. Larson et al. rejected Richards' conclusion, arguing that the humeral torsion of pygmy populations is usually similar to that of peoples of average stature. They argued that Richards et al. cited a 1972 paper that studied a sample of six female Eastern Central African pygmies, and this sample was too small to represent the whole population. Larson et al. also failed to find signs of microcephaly on the studied bones. Larson et al. also studied the relatively short clavicle and the unusual formation of the pectoral girdle. They compared their finding with the skeleton of Nariokotome Boy (variously classified as H. ergaster or H. erectus), and suggested that the pectoral girdle of H. floresiensis was a transitional stage in human shoulder evolution. While some specialists, including paleoanthropologist Russell Ciochon of the University of Iowa, supported the conclusion, others, including Eric Delson of Lehman College, City University of New York, pointed out that the recent sample of H. floresiensis individuals is too small and that Larson's research was based just on one shoulder bone. Tocheri et al. (2007) (including Morwood, Larson, and Jungers), compared three carpal bones believed to belong to LB1 with carpal bones of modern humans, some earlier hominids (that is, hominins), and African apes. They concluded that the carpals from the Liang Bua cave resembled ape carpal bones and were significantly different from the bones of H. sapiens, Homo neanderthalensis or even Homo antecessor, and that they were comparable to carpal bones of Australopithecus. The carpal bones of H. floresiensis were found to lack features that evolved with ancestors of modern humans at least about 800,000 years ago. These features are already formed during embryogenesis and therefore Tocheri et al. argue that it is improbable that the shape of H. floresiensis wrist bones could be a result of a developmental disease. This evidence also suggests that H. Florensiensis is not a modern human with an undiagnosed pathology or growth defect, but that it represents a species descended from a hominin ancestor that branched off before the last common ancestor of the clade that includes modern humans, Neandertals, and other modern hominins. This conclusion was challenged by Robert Martin (after Jacob's death the leading proponent of the microcephaly hypothesis) and Alan Thorne. Martin noted that no research has been done on wrists of microcephalic people. Thorne maintained that the differences were small and that similar variation could occur with living modern humans. He also pointed out that the carpal bones had been found scattered in the cave and it was not certain that they all belonged to the same individual. Project leader Morwood countered that there were also other features—such as the stature, body proportions, brain size, shoulder, pelvis, jaw, and teeth—that suggested that H. floresiensis is a separate hominin species that evolved in isolation on the island. Cranio-osteoanatomical and pathological analysis of LB1 skull by micro-computed tomography however, revealed no pathologies, and no features of Homo sapiens microcephaly, and scientists Balzeau and Charlier conclude that the specimen is not of Homo sapiens origin. Additional features used to argue that the finds come from a population of previously unidentified hominids include the absence of a chin, the relatively low twist of the arm bones, and the thickness of the leg bones. The presence of each of these features has been confirmed by independent investigators but their significance has been disputed. The forearm and pectoral girdle of H. floresiensis have been examined by Larson et al. (2007). Modern humans have the top of the bone twisted between 145 and 165 degrees to the plane of the elbow joint. For LB1, the twist was initially reported to be 110 degrees. Larson later revised this measurement to 120 degrees. This could be an advantage when arm-swinging, but it complicates activities associated with modern people, such as tool-making. As for the pectoral girdle of H. floresiensis, they studied a broken clavicle of LB1 and a shoulder blade of LB6. The clavicle was relatively short, which, in combination with the shape of the shoulder blade and the low twist of the arm bone resulted in the shoulder being moved slightly forward, as shrugged. Thus H. floresiensis could bend the elbow in the way modern people do, and Larson concluded that it was able to make tools. Tocheri et al. 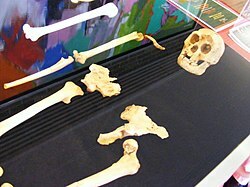 (2007) examined three carpal bones believed to belong to LB1. The shapes of these bones were claimed to differ significantly from the bones of the modern human wrist and to resemble the wrist of great African apes or Australopithecus. The feet of H. floresiensis were unusually flat and unusually long in relation with the rest of the body. As a result, when walking, it would have had to bend its knees further back than modern people do. This forced a high-stepping gait and low walking speed. The toes had an unusual shape and the big toe was very short. In early December 2004, Indonesian paleoanthropologist Teuku Jacob removed most of the remains from their repository, Jakarta's National Research Centre of Archaeology, with the permission of only one of the project team's directors and kept them for three months. Some scientists expressed the fear that important scientific evidence would be sequestered by a small group of scientists who neither allowed access by other scientists nor published their own research. Jacob returned the remains on 23 February 2005 with portions severely damaged and missing two leg bones to the worldwide consternation of his peers. Reports noted the condition of the returned remains, "...[including] long, deep cuts marking the lower edge of the Hobbit's jaw on both sides, said to be caused by a knife used to cut away the rubber mould [...] the chin of a second Hobbit jaw was snapped off and glued back together. Whoever was responsible misaligned the pieces and put them at an incorrect angle [...] The pelvis was smashed, destroying details that reveal body shape, gait and evolutionary history." and causing the discovery team leader Morwood to remark, "It's sickening, Jacob was greedy and acted totally irresponsibly." Jacob, however, denied any wrongdoing. He stated that the damages occurred during transport from Yogyakarta back to Jakarta despite the physical evidence to the contrary that the jawbone had been broken while making a mould of the bones. In 2005, Indonesian officials forbade access to the cave. Some news media, such as the BBC, expressed the opinion that the restriction was to protect Jacob, who was considered "Indonesia's king of palaeoanthropology," from being proven wrong. Scientists were allowed to return to the cave in 2007, shortly after Jacob's death. Models representing a Homo floresiensis, the Flores giant rat, the giant stork Leptoptilos robustus and the dwarf form of elephant Stegodon florensis insularis. The species was formerly thought to have survived on Flores at least until 12,000 years before present, which would have made it the longest lasting known non-Homo sapiens human (unless the Red Deer Cave people belonged to its own species), surviving long past the Neanderthals (H. neanderthalensis), which became extinct between 39,000 and 41,000 years ago. However, subsequent and detailed study of the Liang Bua cave where Homo floresiensis was found show that its youngest osteological remains date to 60,000 years ago, and youngest associated stone tools to 50,000 years ago. Previous younger estimates resulted from the presence of an undetected unconformity in the cave stratigraphy. Because of a deep neighbouring strait, Flores remained isolated during the Wisconsin glaciation (the most recent glacial period), despite the low sea levels that united Sundaland. This has led the discoverers of H. floresiensis to conclude that the species, or its ancestors, could only have reached the isolated island by water transport, perhaps arriving in bamboo rafts around 100,000 years ago (or, if they are H. erectus, then about 1 million years ago). At this time, the islands of Komodo and Flores were joined, leaving a 12-mile-wide (19 km) strait with Komodo visible from the mainland. This idea of H. floresiensis using advanced technology and cooperation on a modern human level has prompted the discoverers to hypothesize that H. floresiensis almost certainly had language. The revised 2016 dating of 50,000 years ago is close to the time that modern humans reached the area, suggesting that the initial encounter with H. sapiens caused or contributed to the demise of H. floresiensis. This would be consistent with the disappearance of H. neanderthalensis from Europe about 40,000 years ago, within 5,000 years after the arrival of modern humans there, and other anthropogenic extinctions. Skeletal material from modern humans dated to 46,000 years ago has been recovered from the Liang Bua cave, strengthening the evidence for a role for modern humans in the extinction. Subsequent to this date, other megafauna of the island (such as the proboscid Stegodon florensis insularis and the giant stork Leptoptilos robustus) also disappeared. In 2004, when H. floresiensis was believed to have survived until 12,000 years ago, Henry Gee, senior editor at Nature, speculated that local stories about a small human-like creature called Ebu Gogo could refer to H. floresiensis, which he suggested might still exist in the unexplored tropical forest of Indonesia. While consensus is emerging that these individuals are a separate species, the finding generated considerable controversy, with some scientists arguing that the specimens were Homo sapiens and that the morphological differences could be attributed to pathology. Prior to Jacob's removal of the fossils, a CT scan was taken of the skull and a virtual endocast of the skull (i.e., a computer-generated model of the skull's interior) of H. floresiensis was produced and analyzed by Dean Falk et al. This team concluded that the brainpan was neither that of a pygmy nor an individual with a malformed skull and brain. In response, Weber et al. conducted a survey the same year comparing the computer model of LB1's skull with a sample of microcephalic human skulls, concluding that the skull size of LB1 falls in the middle of the size range of the human samples and is not inconsistent with microcephaly. Next to dispute the finding of Falk et al. (2005) were Martin et al. (2006), who objected to the failure to compare the model of LB1's skull with a typical example of adult microcephaly. Martin and his coauthors concluded that the skull was probably microcephalic, arguing that the brain is far too small to be a separate dwarf species; if it were, the 400-cubic-centimeter brain would indicate a creature only one foot in height, one-third the size of the discovered skeleton. Shortly thereafter, a group of scientists from Indonesia, Australia, and the United States came to the same conclusion by examining bone and skull structure (Jacob (2006)). Cast of LB1 (left) was compared to several microcephalic skulls, including the microcephalic (right) used by Henneman in his attempt to present LB1 as a microcephalic. Argue (2006) and Lyras (2008) contend the opposite. Brown and Morwood countered by claiming that the skeptics had drawn incorrect conclusions about bone and skull structure and mistakenly attributed the height of H. floresiensis to microcephaly. Falk's team replied to the critics of their study (Falk et al. (2006)). Morphologist Jungers examined the skull and concluded that the skeleton displays "no trace of disease." Argue, Donlon, et al. (2006) rejects microcephaly and concludes that the finds are indeed a new species. Falk et al. (2007) offered further evidence that the claims of a microcephalic H. sapiens were not credible. Virtual endocasts of an additional nine microcephalic brains and ten normal human brains were examined, and it was found that the floresiensis skulls are similar in shape to normal human brains, yet have unique features consistent with what one would expect in a new species. The frontal and temporal lobes of the floresiensis brain were highly developed, in strong contrast to the microcephalic brain, and advanced in ways different from modern human brains. This finding also answered past criticisms that the floresiensis brain was simply too small to support the intelligence required for members of H. floresiensis to create tools found in their proximity. Falk et al. (2007) conclude that the onus is now upon the critics that continue to claim microcephaly to produce a brain of a microcephalic that bears resemblance to the floresiensis brain. Falk's argument was supported by Lyras et al. (2008) in that 3D-morphometric features of the skulls of microcephalic H. sapiens indeed fall within the range of normal H. sapiens and that the LB1 skull falls well outside this range. This was interpreted as proving that LB1 cannot, on the basis of either brain or skull morphology, be classified as a microcephalic H. sapiens. In 2009, a study by Jungers et al. presented a statistical analysis of skull shapes of healthy modern humans, microcephalic humans, and several ancient human species, as well as H. floresiensis. They showed that the three grouped separately, with H. floresiensis among the ancient humans, providing evidence that H. floresiensis is a separate species instead of a diseased modern human. In 2013, a comparison of the LB1 endocast to a set of 100 normocephalic and 17 microcephalic endocasts by Vannucci, Baron and Holloway showed that there is a wide variation in microcephalic brain shape ratios and that in these ratios the group as such is not clearly distinct from normocephalics. The LB1 brain shape nevertheless aligns slightly better with the microcephalic sample, with the shape at the extreme edge of the normocephalic group. The anatomist Gary D. Richards introduced a new skeptical hypothesis in June 2006: that the skeletons from Flores might be the remains of people who suffered from Laron syndrome, a genetic disorder first reported in 1966. This IGF-I deficiency is commonly caused by an exon deletion, and produces two distinct phenotypic changes in the skeleton: short stature and a small skull, which also happen to define the phenotype of H. floresiensis. The next year, a team including Laron himself published a paper arguing that the morphological features of H. floresiensis are essentially indistinguishable from those of Laron syndrome. They compared the cranial and postcranial skeleton of LB1 with those of 64 Laron syndrome patients. The cohort of Laron syndrome patients exhibited statures ranging from 95 to 136 cm in adult females, and 116 to 142 cm in adult males. The estimated height for the LB1 remains places it at the lowest end of the female range. The extremely small endocranial volume of LB1 is actually smaller than anything exhibited in Laron syndrome patients. Despite this inconsistency in brain size, Hershkovitz et al. still assert there are enough characteristics shared between LB1 and the Laron syndrome patients to suggest this pathology explains the skeletal appearance. Critics claim that to determine whether the H. floresiensis individuals had Laron syndrome would require testing their DNA for the presence of the defective genes, if samples of that DNA ever become available. Critics of the hypothesis have however pointed out that despite the low stature, people suffering from Laron syndrome look nothing like the H. floresiensis remains, particularly in the anatomy of the cranial vault. 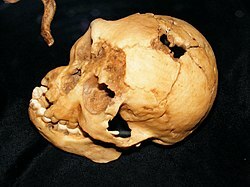 In 2008 Australian researchers Peter J. Obendorf, Charles E. Oxnard, and Ben J. Kefford suggested that LB1 and LB6 suffered from myxoedematous (ME) endemic cretinism resulting from congenital hypothyroidism and that they were part of an affected population of H. sapiens on the island. This disease, caused by various environmental factors including iodine deficiency, is a form of dwarfism still found in the local Indonesian population. Affected people, who were born without a functioning thyroid, have both small bodies and reduced brain size but their mental retardation and motor disability is not as severe as with neurological endemic cretins. According to the authors of the study, the critical environment could have been present on Flores approximately 18,000 years ago, the period to which the LB fossils are dated. They wrote that various features found on the fossils, such as enlarged pituitary fossa, unusually straight and untwisted tops of the upper arm bone and relatively thick limbs, are signs of this diagnosis. The double rooted lower premolar and primitive wrist morphology can be explained in this way as well. The oral stories about strange human-like creatures may also be a record of cretinism. Falk challenged the premise of Oberndorf et al. Studying computer tomography scans of LB1's pituitary fossa, she came to the conclusion that it is not larger than usual. In a paper delivered to the Australasian Society for Human Biology in 2009, Colin Groves and Catharine FitzGerald compared the Flores bones with those of ten people who had had cretinism, focusing on anatomical features typical of the disease. They found no overlap, and stated that they had put the claim to rest. However, an article by Oxnard, Obendorf and Kefford rejects Groves and FitzGerald's argument and revives the cretinism hypothesis. Oxnard and colleagues also criticise the cladistic analysis of Argue et al. (2009), stating that it is not logically possible for the analysis to conclude that the Liang Bua remains represent a separate species and not a pathology because the cladistics analysis assumes that they do not represent a pathology. Brown (2012) compared skeletal and dental morphology in H. floresiensis with the clinical and osteological indicators of cretinism, and the traits that have been argued as representing ME cretinism in LB1 and LB6. He concludes that LB1 and LB6 H. floresiensis are not modern human (H. sapiens) cretins. In 2014, Maciej Henneberg, a critic of the claim that H. floresiensis is a distinct species, argued in a paper published with other scholars in the Proceedings of the National Academy of Sciences that LB1 suffered from Down syndrome, and that the remains of other individuals at the Flores site were merely normal H. sapiens of the Australomelanesian type. Down syndrome is one of the most common human developmental disorders, and is also exhibited in related hominoids such as the orangutan and the chimpanzee. The authors write: "Our consistent hypothesis sees LB1 as a developmentally abnormal member of a recent Australomelanesian H. sapiens population, its features reflecting multiple compatible causes." Colin Groves, of the Australian National University responded that the theory was "implausible" for several reasons, including the fact that abnormal features in the jaw of LB1 are shared by another specimen, LB6. Robert B. Eckhardt of Pennsylvania State University, one of the authors of the new study, rejected the criticism, stating that the study identified significant differences between the jaw of LB1 and LB6. Later M. C. Westaway et al. pointed to a number of characteristics shared by both LB1 and LB6 as well as other known early humans and absent in Homo sapiens such as internal buttressing of the mandibular symphysis and lack of chin. A comparative study concluded that LB1 did not exhibit a sufficient number of Down syndrome characteristics to support a diagnoses of the syndrome. In around 2006, two teams attempted to extract DNA from a tooth discovered in 2003, but both teams were unsuccessful. It has been suggested that this happened because the dentine was targeted; new research suggests that the cementum has higher concentrations of DNA. Moreover, the heat generated by the high speed of the drill bit may have denatured the DNA. In October 2012, a New Zealand scientist due to give a public lecture on Homo floresiensis was told by the Tolkien Estate that he was not allowed to use the word "hobbit" (the title of J. R. R. Tolkien's book The Hobbit) in promoting the lecture. In 2012, the American film studio The Asylum, which produces low-budget "mockbuster" films, planned to release a movie entitled Age of the Hobbits depicting a "peace-loving" community of H. floresiensis "enslaved by the Java Men, a race of flesh-eating dragon-riders." The film was intended to piggyback on the success of Peter Jackson's film The Hobbit: An Unexpected Journey. The film was blocked from release due to a legal dispute about using the word "hobbit." 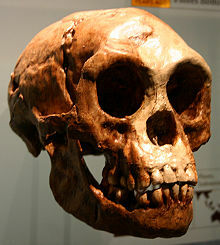 The Asylum argued that the film did not violate the Tolkien copyright because the film was about H. floresiensis, "uniformly referred to as 'Hobbits' in the scientific community." The film was later retitled Clash of the Empires. The Australian Museum has a cast of a H. floresiensis skeleton on display. ^ a b c d e f Sutikna, Thomas; Tocheri, Matthew W.; et al. (30 March 2016). "Revised stratigraphy and chronology for Homo floresiensis at Liang Bua in Indonesia". Nature. 532 (7599): 366–9. Bibcode:2016Natur.532..366S. doi:10.1038/nature17179. PMID 27027286. ^ Zimmer, Carl (20 June 2016). "Are Hobbits Real?". New York Times. Retrieved 21 June 2016. ^ a b c d e f g Brown, P.; et al. (27 October 2004). "A new small-bodied hominin from the Late Pleistocene of Flores, Indonesia". Nature. 431 (7012): 1055–1061. Bibcode:2004Natur.431.1055B. doi:10.1038/nature02999. PMID 15514638. ^ a b c d e f g h i Morwood, M. J.; et al. (13 October 2005). "Further evidence for small-bodied hominins from the Late Pleistocene of Flores, Indonesia". Nature. 437 (7061): 1012–1017. Bibcode:2005Natur.437.1012M. doi:10.1038/nature04022. PMID 16229067. ^ Zimmer, Carl (2 August 2018). "Bodies Keep Shrinking on This Island, and Scientists Aren't Sure Why - The Indonesian island of Flores has given rise to smaller hominins, humans and even elephants". The New York Times. Retrieved 5 August 2018. ^ a b Argue, Debbie; Groves, Colin P. (21 April 2017). "The affinities of Homo floresiensis based on phylogenetic analyses of cranial, dental, and postcranial characters". Journal of Human Evolution. 107: 107–133. doi:10.1016/j.jhevol.2017.02.006. PMID 28438318. ^ a b c d e Morwood, M. J.; et al. (27 October 2004). "Archaeology and age of a new hominin from Flores in eastern Indonesia". Nature. 431 (7012): 1087–1091. Bibcode:2004Natur.431.1087M. doi:10.1038/nature02956. PMID 15510146. ^ Sutikna, Thomas; Tocheri, Matthew W.; Morwood, Michael J.; Saptomo, E. Wahyu; Jatmiko; Awe, Rokus Due; Wasisto, Sri; Westaway, Kira E.; Aubert, Maxime; Li, Bo; Zhao, Jian-xin; Storey, Michael; Alloway, Brent V.; Morley, Mike W.; Meijer, Hanneke J. M.; van den Bergh, Gerrit D.; Grün, Rainer; Dosseto, Anthony; Brumm, Adam; Jungers, William L.; Roberts, Richard G. (30 March 2016). "Revised stratigraphy and chronology for Homo floresiensis at Liang Bua in Indonesia". Nature. 532 (7599): 366–369. Bibcode:2016Natur.532..366S. doi:10.1038/nature17179. PMID 27027286. ^ Ritter, Malcolm (30 March 2016). "Study: Indonesia "hobbit" fossils older than first thought". Associated Press. Retrieved 1 April 2016. ^ Amos, Jonathan (30 March 2016). "Age of 'Hobbit' species revised". BBC News. Retrieved 1 April 2016. ^ Callaway, E. (2016-06-08). "'Hobbit' relatives found after ten-year hunt". Nature. 534 (7606): 164–165. Bibcode:2016Natur.534Q.164C. doi:10.1038/534164a. PMID 27279191. ^ Brumm, A.; van den Bergh, G. D.; Storey, M.; Kurniawan, I.; Alloway, B. V.; Setiawan, R.; Setiyabudi, E.; Grün, R.; Moore, M. W.; Yurnaldi, D.; Puspaningrum, M. R.; Wibowo, U. P.; Insani, H.; Sutisna, I.; Westgate, J. A.; Pearce, N. J. G.; Duval, M.; Meijer, H. J. M.; Aziz, F.; Sutikna, T.; van der Kaars, S.; Flude, S.; Morwood, M. J. (2016-06-08). "Age and context of the oldest known hominin fossils from Flores". Nature. 534 (7606): 249–253. Bibcode:2016Natur.534..249B. doi:10.1038/nature17663. PMID 27279222. ^ a b van den Bergh, G. D.; Kaifu, Y.; Kurniawan, I.; Kono, R. T.; Brumm, A.; Setiyabudi, E.; Aziz, F.; Morwood, M. J. (2016-06-08). "Homo floresiensis-like fossils from the early Middle Pleistocene of Flores". Nature. 534 (7606): 245–248. Bibcode:2016Natur.534..245V. doi:10.1038/nature17999. PMID 27279221. ^ McKie, Robin (21 February 2010). "How a hobbit is rewriting the history of the human race". The Guardian. Retrieved 23 February 2010. ^ a b c d Tocheri, M.W. ; Orr, CM; Larson, SG; Sutikna, T; Jatmiko; Saptomo, EW; Due, RA; Djubiantono, T; et al. (21 September 2007). "The Primitive Wrist of Homo floresiensis and Its Implications for Hominin Evolution" (PDF). Science. 317 (5845): 1743–5. Bibcode:2007Sci...317.1743T. doi:10.1126/science.1147143. PMID 17885135. ^ a b Holmes, Bob (20 September 2007). "'Hobbitt' wrist bones suggest a distinct species". New Scientist. ^ Randerson, James (21 September 2007). "Yes, it's a Hobbit. The debate that has divided science is solved at last (sort of)". Guardian. ^ Argue, Debbie; et al. (July 2009). "Homo floresiensis: A cladistic analysis". Journal of Human Evolution. Online Only as of Aug 4, 09. (5): 623–639. doi:10.1016/j.jhevol.2009.05.002. PMID 19628252. ^ Dembo, M.; Matzke, N. J.; Mooers, A. Ø.; Collard, M. (2015). "Bayesian analysis of a morphological supermatrix sheds light on controversial fossil hominin relationships" (PDF). Proceedings of the Royal Society B: Biological Sciences. 282 (1812): 20150943. doi:10.1098/rspb.2015.0943. PMC 4528516. PMID 26202999. Retrieved 21 April 2017. ^ Zhu Zhaoyu (朱照宇); Dennell, Robin; Huang Weiwen (黄慰文); Wu Yi (吴翼); Qiu Shifan (邱世藩); Yang Shixia (杨石霞); Rao Zhiguo (饶志国); Hou Yamei (侯亚梅); Xie Jiubing (谢久兵); Han Jiangwei (韩江伟); Ouyang Tingping (欧阳婷萍) (2018). "Hominin occupation of the Chinese Loess Plateau since about 2.1 million years ago". Nature. 559 (7715): 608–612. doi:10.1038/s41586-018-0299-4. ISSN 0028-0836. PMID 29995848. ^ Dalton, Rex (28 October 2004). "Little lady of Flores forces rethink of human evolution". Nature. 431 (7012): 1029. Bibcode:2004Natur.431.1029D. doi:10.1038/4311029a. PMID 15510116. ^ Marwick, Ben; Clarkson, Chris; O'Connor, Sue; Collins, Sophie (December 2016). "Early modern human lithic technology from Jerimalai, East Timor". Journal of Human Evolution. 101: 45–64. doi:10.1016/j.jhevol.2016.09.004. PMID 27886810. ^ a b Argue, D.; Donlon, D.; Groves, C.; Wright, R. (October 2006). "Homo floresiensis: Microcephalic, pygmoid, Australopithecus, or Homo?". Journal of Human Evolution. 51 (4): 360–374. doi:10.1016/j.jhevol.2006.04.013. PMID 16919706. ^ a b c d e Jacob, T.; Indriati, E.; Soejono, R. P.; Hsu, K.; Frayer, D. W.; Eckhardt, R. B.; Kuperavage, A. J.; Thorne, A.; Henneberg, M. (5 September 2006). "Pygmoid Australomelanesian Homo sapiens skeletal remains from Liang Bua, Flores: Population affinities and pathological abnormalities". Proceedings of the National Academy of Sciences of the United States of America. 103 (36): 13421–13426. Bibcode:2006PNAS..10313421J. doi:10.1073/pnas.0605563103. PMC 1552106. PMID 16938848. ^ Kaifu, Yousuke; Kono, Reiko T.; Sutikna, Thomas; Saptomo, Emanuel Wahyu; Jatmiko, . ; Due Awe, Rokus (18 November 2015). Bae, Christopher, ed. "Unique Dental Morphology of Homo floresiensis and Its Evolutionary Implications". PLOS One. 10 (11): e0141614. Bibcode:2015PLoSO..1041614K. doi:10.1371/journal.pone.0141614. PMC 4651360. PMID 26624612. ^ Yirka, Bob (20 November 2015). "Dental analysis suggests Homo floresiensis was a separate species from modern man". phys.org. Retrieved 21 November 2015. ^ "Pygmy". Encyclopædia Britannica. Archived from the original on 8 January 2008. ^ Fix, Alan G. (June 1995). "Malayan Paleosociology: Implications for Patterns of Genetic Variation among the Orang Asli". American Anthropologist. New Series. 97 (2): 313–323. doi:10.1525/aa.1995.97.2.02a00090. JSTOR 681964. ^ "Weber ch. 5". Andaman.org. Archived from the original on 10 July 2012. Retrieved 1 October 2011. ^ Morwood, M. J.; O'Sullivan, P. B.; Aziz, F.; Raza, A. (12 March 1998). "Fission-track ages of stone tools and fossils on the east Indonesian island of Flores". Nature. 392 (6672): 173–176. Bibcode:1998Natur.392..173M. doi:10.1038/32401. ^ Van Den Bergh, G. D.; Rokhus Due Awe; Morwood, M. J.; Sutikna, T.; Jatmiko; Wahyu Saptomo, E. (May 2008). "The youngest Stegodon remains in Southeast Asia from the Late Pleistocene archaeological site Liang Bua, Flores, Indonesia". Quaternary International. 182 (1): 16–48. Bibcode:2008QuInt.182...16V. doi:10.1016/j.quaint.2007.02.001. ^ Lomolino, M.V. (1985). "Body size of mammals on islands: The island rule reexamined". The American Naturalist. 125 (2): 310–316. doi:10.1086/284343. ^ Elegant, Simon (30 April 2005). "Science: Bones of Contention". Time. Rampasasa. Retrieved 16 January 2011. ^ Tran, Mark (7 May 2009). "Indonesian 'hobbits' were distinct human species, say researchers". London: guardian.co.uk. Retrieved 24 February 2010. ^ Tucci, S.; et al. (2018-08-03). "Evolutionary history and adaptation of a human pygmy population of Flores Island, Indonesia". Science. 361 (6401): 511–516. doi:10.1126/science.aar8486. PMID 30072539. ^ a b c d Falk, D.; et al. (8 April 2005). "The Brain of LB1, Homo floresiensis". Science. 308 (5719): 242–5. Bibcode:2005Sci...308..242F. doi:10.1126/science.1109727. PMID 15749690. ^ a b Falk, D.; et al. (19 May 2006). "Response to Comment on 'The Brain of LB1, Homo floresiensis'". Science. 312 (5776): 999c. Bibcode:2006Sci...312.....F. doi:10.1126/science.1124972. ^ Weston, E. M.; Lister, A. M. (7 May 2009). "Insular dwarfism in hippos and a model for brain size reduction in Homo floresiensis". Nature. 459 (7243): 85–8. Bibcode:2009Natur.459...85W. doi:10.1038/nature07922. ISSN 0028-0836. PMC 2679980. PMID 19424156. ^ "Hippo's island life helps explain dwarf hobbit". Natural History Museum. 7 May 2009. Archived from the original on 6 August 2011. Retrieved 1 October 2011. ^ a b "Science Magazine" (PDF). 19 May 2006. Retrieved 1 October 2011. ^ Anna Salleh. (21 September 2007). "Wrist gives hobbit theory the flick". ABC.net.au. Retrieved 14 September 2012. ^ Dalton, Rex (2010). "Hobbit origins pushed back". Nature. 464 (7287): 335. doi:10.1038/464335a. ISSN 0028-0836. PMID 20237533. ^ Brumm, Adam; Jensen, Gitte M.; van den Bergh, Gert D.; Morwood, Michael J.; Kurniawan, Iwan; Aziz, Fachroel; Storey, Michael (2010). "Hominins on Flores, Indonesia, by one million years ago". Nature. 464 (7289): 748–752. Bibcode:2010Natur.464..748B. doi:10.1038/nature08844. ISSN 0028-0836. PMID 20237472. ^ Balzeau, Antoine; Charlier, Philippe (2016). "What do cranial bones of LB1 tell us about Homo floresiensis?". Journal of Human Evolution. 93: 12–24. doi:10.1016/j.jhevol.2015.12.008. ISSN 0047-2484. PMID 27086053. ^ Jungers, William L.; Larson, S.G.; Harcourt-Smith, W.; Morwood, M.J.; Sutikna, T.; Due Awe, Rokhus; Djubiantono, T. (4 December 2008). "Descriptions of the lower limb skeleton of Homo floresiensis". Journal of Human Evolution. 57 (5): 538–54. doi:10.1016/j.jhevol.2008.08.014. PMID 19062072. Archived from the original on 5 January 2013. ^ Blaszczyk, Maria B.; Vaughan, Christopher L. (2007). "Re-interpreting the evidence for bipedality in Homo floresiensis". South African Journal of Science. 103 (103): 103. ^ Callaway, Ewen (16 April 2008). "Flores 'hobbit' walked more like a clown than Frodo". New Scientist. 3. pp. 983–984. ^ Connor, Steve (30 November 2004). "Hobbit woman' remains spark row among academics". New Zealand Herald. ^ "Fight over access to 'hobbit' bones – being-human". New Scientist. 11 December 2004. ^ Times Online (3 December 2004). "Professor fuels row over Hobbit man fossils". London. ^ a b c "Hobbits triumph tempered by tragedy". Sydney Morning Herald. 5 March 2005. ^ Powledge, Tabitha M. (28 February 2005). "Flores hominid bones returned". The Scientist. Retrieved 28 February 2009. ^ a b c "Hobbit cave digs set to restart". BBC News. 25 January 2007. ^ Ghosh, Pallab (20 August 2014). "New dates rewrite Neanderthal story". BBC News. ^ "Indonesian 'Hobbits' may have died out sooner than thought". Science Daily. 30 March 2016. ^ "Skeleton reveals lost world of 'Little people'". Science Daily. 28 October 2004. ^ Callaway, E. (30 March 2016). "Did humans drive 'hobbit' species to extinction?". Nature. doi:10.1038/nature.2016.19651. ^ Callaway, Ewen (20 August 2014). "Neanderthals: Bone technique redrafts prehistory". Nature. 512 (7514): 242. Bibcode:2014Natur.512..242C. doi:10.1038/512242a. PMID 25143094. ^ "'Hobbit' joins human family tree". BBC News. 27 October 2004. ^ Weber, J.; Czarnetzki, A.; Pusch, C.M. (14 October 2005). 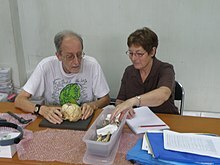 "Comment on "The Brain of LB1, Homo floresiensis"". Science. 310 (5746): 236. doi:10.1126/science.1114789. PMID 16224005. ^ von Bredow, Rafaela (1 September 2006). "Indonesia's "Hobbit": A Huge Fight over a Little Man". Der Spiegel. ^ "'Hobbit' Bones Said to Be of Deformed Human". Los Angeles Times. 20 May 2006. ^ Wilford, John Noble (21 August 2006). "Report Reignites Feud Over 'Little People' as Separate Species". The New York Times. ^ Vergano, Dan (16 July 2006). "The hullabaloo about hobbits". USA Today. ^ a b Falk, D.; Hildebolt, C.; Smith, K.; Morwood, M.J.; Sutikna, T.; Others (2 February 2007). "Brain shape in human microcephalics and Homo floresiensis". Proceedings of the National Academy of Sciences. 104 (7): 2513–8. Bibcode:2007PNAS..104.2513F. doi:10.1073/pnas.0609185104. PMC 1892980. PMID 17277082. ^ Vannucci, Robert C.; Barron, Todd F.; Holloway, Ralph L. (2013). "Frontal Brain Expansion During Development Using MRI and Endocasts: Relation to Microcephaly and Homo floresiensis". The Anatomical Record. 296 (4): 630–637. doi:10.1002/ar.22663. ISSN 1932-8486. PMID 23408553. ^ Hershkovitz, Israel; Kornreich, Liora; Laron, Zvi (2007). "Comparative skeletal features between Homo floresiensis and patients with primary growth hormone insensitivity (Laron syndrome)". American Journal of Physical Anthropology. 134 (2): 198–208. doi:10.1002/ajpa.20655. ISSN 0002-9483. PMID 17596857. ^ Science News (15 July 2006). "Did small hominids have a genetic defect?". ScienceNews. 170 (3): 46. doi:10.1002/scin.5591700316. ^ a b c d Obendorf, P.J. ; Oxnard, C.E. ; Kefford, C.E. (7 June 2008). "Are the small human-like fossils found on Flores human endemic cretins?". Proceedings of the Royal Society B. 275 (1640): 1287–1296. doi:10.1098/rspb.2007.1488. PMC 2602669. PMID 18319214. ^ Groves, C.; Fitzgerald, C. (2010). "Healthy hobbits or victims of Sauron". HOMO - Journal of Comparative Human Biology. 61 (3): 211. doi:10.1016/j.jchb.2010.01.019. ^ "Flores hobbits didn't suffer from cretinism". New Scientist. 206 (2766): 17. 2010. doi:10.1016/S0262-4079(10)61537-0. ISSN 0262-4079. ^ a b Oxnard, C.; Obendorf, P.J. ; Kefford, B.B. (2010). "Post-cranial skeletons of hypothyroid cretins show a similar anatomical mosaic as Homo floresiensis". PLOS One. 5 (9): e13018. Bibcode:2010PLoSO...513018O. doi:10.1371/journal.pone.0013018. PMC 2946357. PMID 20885948. ^ Brown, Peter (2012). "LB1 and LB6 Homo floresiensis are not modern human (Homo sapiens) cretins". Journal of Human Evolution. 62 (2): 201–224. doi:10.1016/j.jhevol.2011.10.011. ISSN 0047-2484. PMID 22277102. ^ a b Nogrady, Bianca (5 August 2014). "Did the 'Hobbit' have Down syndrome?". ABC. ^ Westaway, Michel Carrington; Durband, Arthur C. C; Groves, Colin P.; Collard, Mark (17 February 2015). "Mandibular evidence supports Homo floresiensis as a distinct species". Proceedings of the National Academy of Sciences. 112 (7): E604–E605. Bibcode:2015PNAS..112E.604W. doi:10.1073/pnas.1418997112. PMC 4343145. PMID 25659745. ^ Baab, Karen (8 June 2016). "A Critical Evaluation of the Down Syndrome Diagnosis for LB1, Type Specimen of Homo floresiensis". PLOS One. 11 (6): e0155731. Bibcode:2016PLoSO..1155731B. doi:10.1371/journal.pone.0155731. PMC 4898715. PMID 27275928. ^ Cheryl Jones (5 January 2011). "Researchers to drill for hobbit history : Nature News". Nature. doi:10.1038/news.2011.702. Retrieved 1 October 2011. ^ Lee, Julian (24 October 2012). "Hobbit makers ban uni from using 'hobbit'". 3 News NZ. Archived from the original on 7 June 2013. Retrieved 29 October 2013. ^ Somma, Brandon (4 January 2013). "Masters of the Mockbuster:What The Asylum Is All About". The Artifice. ^ a b "The Hobbit producers sue 'mockbuster' film company". BBC. 8 November 2012. Retrieved 10 November 2012. ^ a b Fritz, Ben (10 December 2012). "'Hobbit' knockoff release blocked by judge". Los Angeles Times. Retrieved 11 December 2012. Falk, Dean (2011). The Fossil Chronicles: How Two Controversial Discoveries Changed Our View of Human Evolution. University of California Press. ISBN 978-0-520-26670-4. Martin, R. D.; MacLarnon, A. M.; Phillips, J. L.; Dussubieux, L.; Williams, P. R.; Dobyns, W. B. (19 May 2006). "Comment on "The Brain of LB1, Homo floresiensis"". Science. 312 (5776): 999. Bibcode:2006Sci...312.....M. doi:10.1126/science.1121144. PMID 16709768. Morwood, Mike; van Oosterzee, Penny (2007). A New Human: The Startling Discovery and Strange Story of the "Hobbits" of Flores, Indonesia. Smithsonian Books. ISBN 978-0-06-089908-0. Tattersall, Ian (2015). The Strange Case of the Rickety Cossack and other Cautionary Tales from Human Evolution. Palgrave Macmillan. ISBN 978-1-137-27889-0. Weber, George. "Lonely islands: The Andamanese (Ch. 5)". Andaman Association. Archived from the original on 10 July 2012. Wikimedia Commons has media related to Homo floresiensis. Hawks, John. Blog of a professor of anthropology who closely follows this topic. "Another diagnosis for a hobbit" (online). 3 July 2007. "The Liang Bua report" (online). 10 August 2007. "The forelimb and hindlimb remains from Liang Bua cave" (online). 18 December 2008. "Hominin remains from Mata Menge, Flores" (online). 8 June 2016. Obendorf, Peter; Oxnard, Charles E.; Kefford, Ben J. (5 March 2008). "Were Homo floresiensis just a population of myxoedematous endemic cretin Homo sapiens?". Proceedings of the Royal Society B: Biological Sciences. -1 (–1): –1. Blog commentary on the Obendorf paper.